Success on the 15 miler! Saturday morning I ran my 15 mile benchmark run. Yes, it took awhile (2:20). Yes, it was painful. And yes, I’m extremely happy to have it behind me. It is clear that my body has physical limitations that I’m ignoring. As I cruised back into my driveway, pretty much everything below the waist was screaming in pain. I got another blister on my left foot between my toes of all places. This is in spite of my liberal use of Bodyglide and Vaseline on my feet before starting the run. It is still very difficult to imagine running 26.2 miles. Next up is the 18 mile benchmark next weekend. I’ve got 7 days to heal up and mentally prepare for it. I’m really hoping that my feet, knees and hips gain some value and perspective from the 15 miler and decide to get on-board. I was looking at some pics that I took on the Oregon coast a few weeks ago. 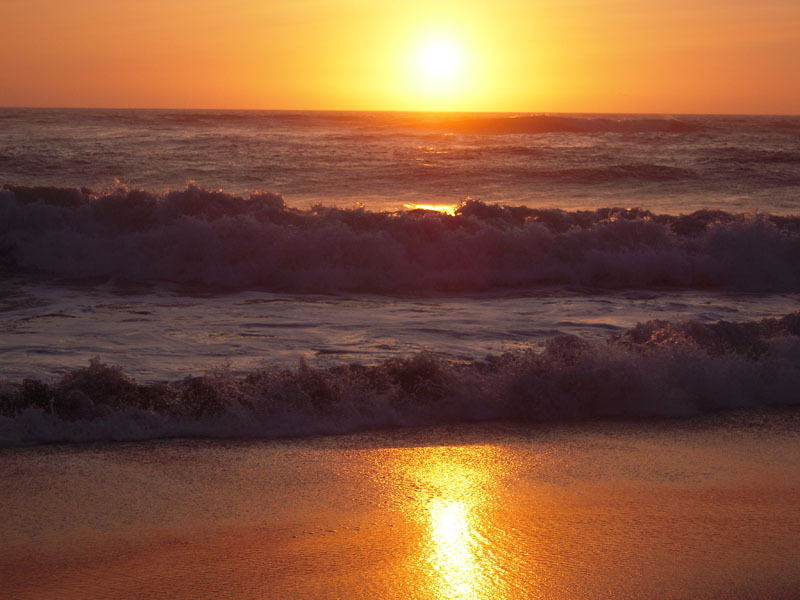 We rented a house at the beach for a couple of nights and the sunsets were amazing. I managed to snap off a couple of pics one evening while we were building a fire to roast marshmallows. As Kirsten and I were walking the dog earlier this evening, we both noticed a certain coolness in the air and it dawned on us that our short Oregon summer is almost over. So, take a good look at that glowing orb now, because it won’t be around much longer. Fall is right around the corner and we’ve got 7-9 months of cold, rainy, depressing weather ahead of us. My brother-in-law Dave and I hit a couple of parks early in the morning this past Sunday. The first park didn’t give up more than a few clad coins and had lots of trash, so we headed to another park that I found using Google maps. We spent a few minutes in the tot lot and then moved on to the open grass field. I recovered what appeared to be a silver ring about 3-4 inches down under a tree along the fence row. It’s the ring on the right in the first pic. I cleaned it up but couldn’t find a stamp on it. It could be a mood ring as it has some kind of greenish-gray, opaque material around the outside. While I continued to work my way down the fence row digging lots and lots of pulltabs, David meandered around the field. 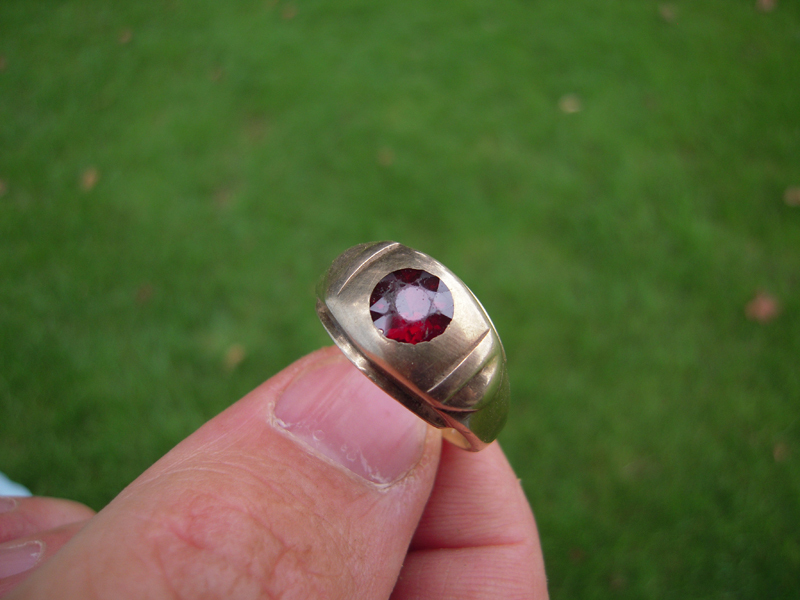 Awhile later he came over and asked if I found anything good – and then showed me a big 10k gold mens ring with a dark red stone in it (second pic). My mouth dropped open when I saw it because it is a really cool looking ring. And as luck would have it – the ring fits him perfectly! Needless to say I was jealous, so I furiously went back to swinging and dug a bunch more pulltabs and a few coins. As I was slowly making my way back to the truck I got another hit and recovered my second ring for the day. Unfortunately it wasn’t stamped either and apparently lost a fight with a lawn mower because it was creased on one side. All in all it was a great day of detecting and I’m happy that Dave took a gold ring home. It was my first trip out with my new Super 12″ Spider coil on the MXT. I’m pleased to say that it worked very well, especially at the second park which had a lot less trash than the first one we hit. “Why aren’t you signed up for the 401K? Happy days! This past Saturday morning I ran a 13.5 miler which is my new personal distance record. I’ve done 3 half marathons in the past, but never actually ran further than the 13.1 mile distance. I’m happy to report that, other than the general post-run soreness, my feet and legs felt pretty good. It was a little tough climbing out of bed the following day, but so far my heel pain has remained tolerable. Next up is the 15 mile benchmark, which I hope to run this coming weekend. If that goes well, I’ll move on to the 30k (18.6 mile) benchmark and then (hopefully) run the 21 mile benchmark with my Portland Fit group on September 13. I had a day off last week during our heat spell and decided to try my luck at a local river beach. The temp was expected to rise well over 100 degrees so I figured being near the water would be a little cooler. 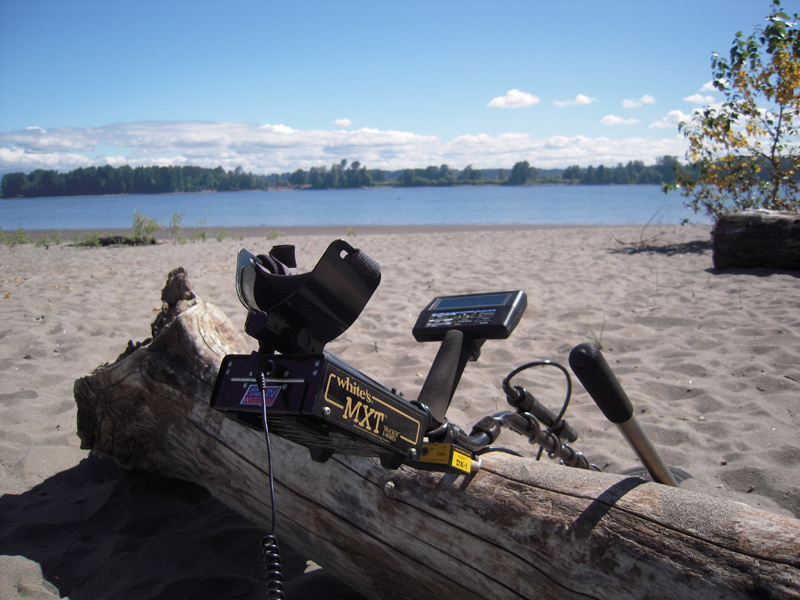 I arrived early in the morning at a beach that I had detected last summer. After an hour or so I hadn’t found much so I decided to move to another beach further down the river. Over the next 3-4 hours I covered a large section of the beach pretty hard with my White’s MXT and my long handled sand scoop. It was clear that no one had detected this section of the beach recently. 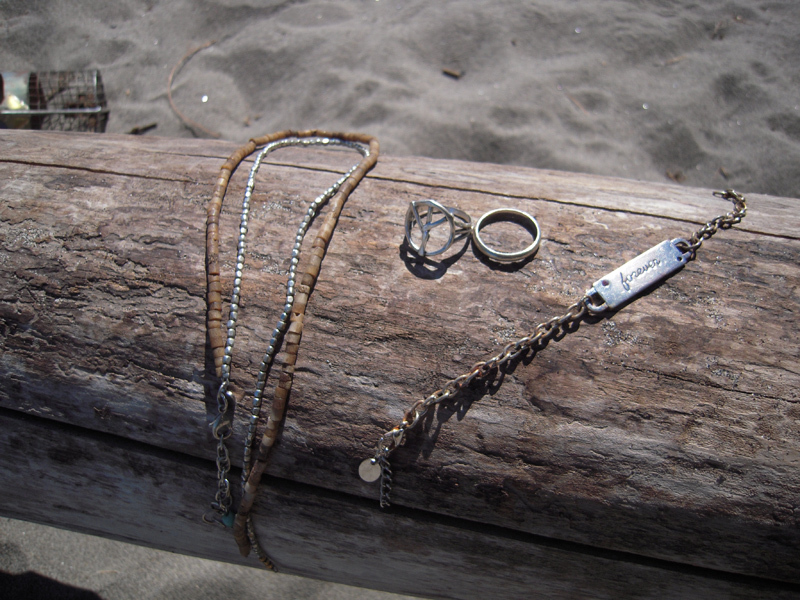 I found the necklace and bracelet in the wet sand area near the river. 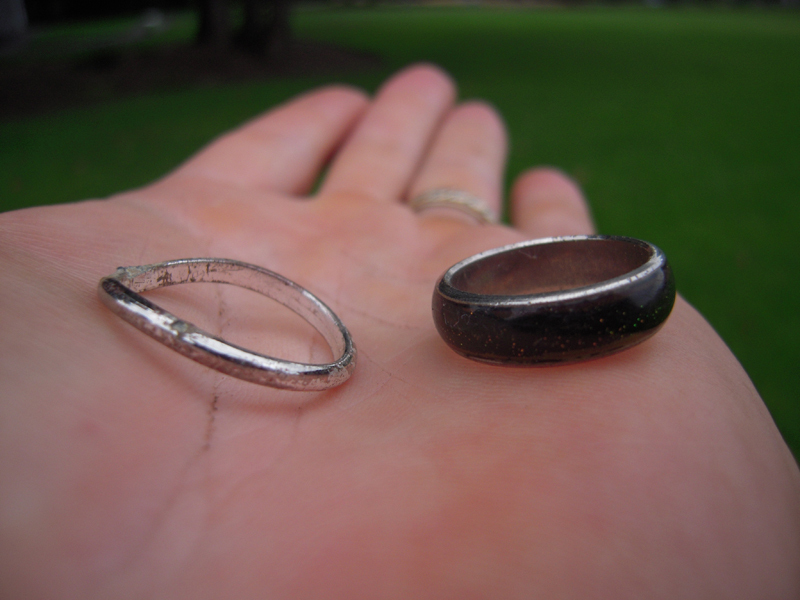 However, both rings were found up high on the beach in the dry sand near trees and bushes. None of the jewelry is valuable, but my treasure box keeps filling up and I know that I’m 2 rings closer to the finding the “big one”. 10 miler – hurts so good! Alright, I’m aware that I’ve been negligent in my posting duties. Life gets crazy…blah blah blah. I went out for a run last night after work. It was the first time in awhile that my legs & feet actually felt good. I paced around my kitchen for 30 minutes or so waiting for the dark black rainclouds to disperse. I’ve been thinking a lot about the Portland Marathon lately (I registered a couple of weeks ago – so I’m committed, or at the very least $90 poorer now). I started counting the days left to train and I realized that…I’m screwed. It was vaguely similar to feelings that I had back in my college days. You know, realizing that you needed only a week to study for a test, but unfortunately the test was in 2 days… Anyone? Anyone? Anyway, back to my run. So knowing that I had less than 2 hours of daylight left, I quickly dressed myself in black shorts, black shirt, black hat and dark sunglasses. I slapped my Garmin on my wrist and headed out the door into a heavy rain shower. Did I mention that I was trying out some new arch support insoles (more on that later)? I normally walk for the first 10 minutes so that my muscles warm up. Since it was raining pretty hard, I decided to just start running right away. I’m not sure why I did this actually. It certainly didn’t help me outrun the rain and my left calf muscle complained for awhile. I kept my pace slow (like 9-9.5 minute miles) and settled into an easy rhythm. I eventually got out from underneath the rain cloud and the glorious late evening sun bathed me in its warmth. Two things that I normally carry with me on longer runs: an Ipod Nano (full of techno tunes) and a hydration belt with a water bottle were not with me today. My long run course does take me close to 2-3 parks, so I stopped off for a quick water break whenever I could. I will say that it was an interesting experience running without music. I’ve always relied heavily on the extended length, thumping bass beats of techno music to put me into “the zone”. This time I focused in on my own breathing rhythm and I was amazed to find a “parallel zone” of sorts. After 5 miles or so, I was feeling good about my pace. My heart rate was stable and I had no soreness or pain anywhere. I was thinking “This is what running is supposed to feel like”. I wasn’t much further down the road when I started feeling a little heat and friction coming from the soles of my feet. Specifically my arches. I mentioned earlier that I was trying out some new replacement insoles which offered a little more midfoot support than the stock foam insoles that came with my Asics Gel Kayano’s. Well, it was clear that my feet weren’t used to that extra support, and after 6-7 miles they were letting me know. Yep, I probably should have tried those out on a shorter run. Another lesson learned. As expected, my knees were the next body part to start complaining. It was a subtle complaint at first – I’ll give them that much. It was kind of like, “Excuse me, but we are ready to stop running now”. A little later, somewhere between mile 8-9, the complaints were more like “If you don’t stop running now, we’re going to make your life hell for the next 24-48 hours”. I went back to my parallel zone and pressed on. By the time I cruised into my neighborhood at mile 10, I had a full on mutiny happening, with feet, ankles, knees and hips all conspiring to make me stop. It was pretty much dark at this point, so I limped into my house and collapsed into a chair. I’m writing this post less than 24 hours later, and yes I’m still pretty sore. Getting out of bed this morning took a little longer than usual. I won’t be running again this evening, but I think I’ll be ready to hit it again by tomorrow evening. Maybe I’ll take my Ipod next time so that I can drown out the complaints. I managed to run 3-4 times in the last week or so. My right heel still has some mild tenderness, but the serious pain has been absent. Granted I’ve been limiting my runs to 5-6 miles each, I’m still very, very excited to be back on the pavement. I’m going to kick it up to 7-8 mile runs and see how that goes. I actually may still have time to catch up in time for the Portland Marathon. Speaking of which, I finally decided it was time, so I registered myself for the PM yesterday. If my injury returns and I cannot run, I guess I’ll consider my $90 entry fee a donation to a good program. Oh, on my run this morning I ran into some wildlife on the trail. About 1 mile into my run I came upon a black and white animal that I first thought was a cat. It wasn’t. As I got closer, the “cat” stood on its front legs and aimed its rear end at me. Somewhere deep in my head I thought…hmm…cats usually don’t do tricks. It was at that very moment that I also realized that cats usually aren’t black with white stripes. I think I figured this out just before running within spraying range of the skunk. I stopped, backed up a few steps and waited for it to leave the trail for cover in the bushes.